Besides being of the most interesting sport in modern day, futsal is also an amazingly useful instrument for the development youth and their skills and their abilities. Besides that, there is a growing tendency of professional football players to play futsal in order to improve their skills for the professional careers and because of that it seems that futsal training can actually serve as one kind of replacement for the football training. 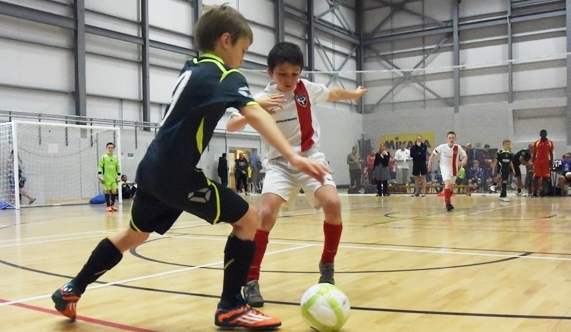 More and more football developing academies incorporate the futsal into their program. In some countries national football associations are recommending that futsal should be included in the training programs in situations when that is possible to do. One of those football associations is the English FA. It is known fact that during winter months many football games in the youth leagues get cancelled due to the cold weather, frozen fields and many other different factors. In those situations, it happens that young players do not play a single for several consecutive games which may affect their level of motivation. The FA is recommending that in cooperation with teams, players, coaches, and parents, a winter futsal league should be organized in order for young players to continue training and to still have some competitions when their leagues matches cannot be played due to the bad winter. The response that FA got from players, teams and coaches was amazingly positive and everybody involved expresses their readiness to establish Winter Futsal League. For young players this will be great opportunity to further develop their football skills. Futsal, being a game with a huge number of occasions when players actually touch ball, is great instrument for players to learn to control ball in a tight space and in increased intensity of the game that is, to develop their skills that they can use in football game. According to the people responsible for the youth, development, academies the response that the received from youth players was very encouraging. Besides being able to touch the ball more often, youth players learn how to make decisions instantly and under pressure and what is perhaps the most important is to further develop their sense of being part of the team and the importance of playing for the team. Looking at the comments from youth players who actually went through the Winter Futsal League it is possible to see how useful for their development that league was. Great majority of them actually said that it helped them in learning how to control ball under pressure, something that might be hard to learn in football training. Besides that, they witness that futsal helped to improve their process of decision making and to do it in short period of time because in futsal there is not a lot of time to think about your next move. All of this actually had a tremendous influence on their self confidence which is, as probably every player out there knows, is the most important thing in any sport. The response from the coaches is yet another proof of the importance of the futsal in the development of youth. In their opinion, young players while playing futsal were put in situations where it was expected of them to adapt and to make creative decisions and to look for way in which they would get out of the tight spaces. According to the coaches, all of these skills will undoubtedly help them when they return to football training and most importantly it will help their teams. Looking beyond the development of skills required for playing football, futsal training also had more important effects as well. Besides developing their basic football skills, young players also learned what it means to play for the team under pressure. They also learned that doing something individually in futsal will not in great majority of cases finish as they intended it. Being a team player is not only important for sport. Learning to be a team player means also that you develop your emphatic and sympathetic skills which are actually more important in the real world. Besides that, the level of self-confidence is not the same when youth players started their futsal training and when they finished it. The level of self-confidence became much higher in the end and that could be seen in the field. As all of us is very aware, self-confidence is very important not only in sport but in everyday life and every activity that works on the development of such skills in very positive activity that should be more encouraged.